Clifford was born on 26 October 1894, at Market Street, Buxton. He was the son of Isaac (Carter) and Hannah (née Redfern) Woodward. He had seven older siblings, Helen, Fred, Hilda, Frank, Joseph, Charles and Claude, and three young ones, Vauncey, Ellis and Sidney (1901 Census RG 13/3269). In 1901 the family were living at 14 New Market Street. By 1911 (Census RG 14/21242) the family had moved again to Byfield House, Buxton, and Tom had been added to the family. Clifford was still living at home, employed as a "Labourer, Buxton Urban District Council". Clifford enlisted into the 2nd Battalion, The Middlesex Regiment, in Buxton and his Medal Index Card shows that he was posted to France on the 31st May 1915. Unfortunately, his Service Papers have not survived the ravages of Second World War bombing. In August 1914 the 2nd Battalion was at Malta and returned to England in September and moved to Hursley Park, attached to 23rd Brigade in 8th Division. It landed at Le Havre on the 7th November 1914, so Clifford must have joined as a reinforcement after training. During 1915 Frederick's 8th Division took part in The Battle of Neuve Chapelle, (10th March - 22nd April) and The Battle of Aubers Ridge, (9th - 10th May) and in 1916, during the Battle of the Somme, The Battle of Albert, (1st - 13th July 1916). 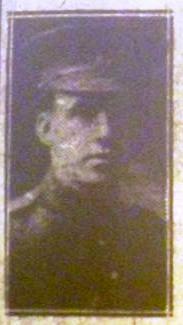 However, according to 'The Buxton Advertiser' (15th July 1916) Clifford had been wounded in action in December 1915 and was in hospital in Glasgow since January 1916. Fully recovered he enjoyed a short leave at home and returned to his Battalion on the same day the paper was published. The Battle of Messines took place from June 7th - 14th 1917 before the next major engagement, The Battle of Third Ypres began on 31st July. On the 16th August the Battle of Langemarck began, lasting three days. There was an attack on a nine-mile front north of Ypres-Menin road, crossing Steenbeek River, and capturing all objectives. The British captured Langemarck, and established positions half a mile beyond; on high ground north of Menin Road. However, the German army pressed back the British from ground won earlier in the day. Although it was high summer, the British attack took place in an endless landscape of deep mud, rain filled and slimy shell holes, and the unnaturally broad waters of the Steenbeek. "4.45 a.m. The Battalion took part in offensive operations in an easterly direction immediately SOUTH of the YPRES - ROULERS RLY. ...... Casualties: Officers: (a) killed: 2/Lieut. E. J. BILBY; (b) wounded: Capt. S. F. W. M. del COURT; 2.Lieuts. E. S. MATTHEWS; P. CUNNINGHAM; C. T. M. HALL and A. E. TURTON; (c) missing: 2/Lieut. W. E. R. SMITH. Other Ranks: (a) killed 11; (b) wounded 151; (c) missing 23. Bn. relieved by 2/SCOTTISH RIFLES and withdrew to SWAN CHATER." As well as 2/Lt. Eustace John Bilby the missing Officer, 2/Lt. 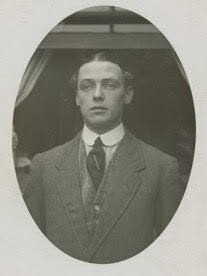 Wilfred George Richard Smith, was also killed in action. Things were rather worse than reported for the other ranks as well. In addition to Clifford, 47 other men are recorded as having been killed or died of wounds on the 16th. Six more died of wounds in the following few days. Clifford is now buried at Tyne Cot Cemetery, but may have been moved there after The Armistice. 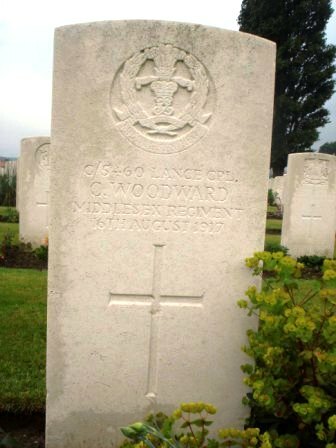 · Clifford's older brother Private Charles WOODWARD, was also killed in action on 15 September 1916.
he fought on 16 August 1917.